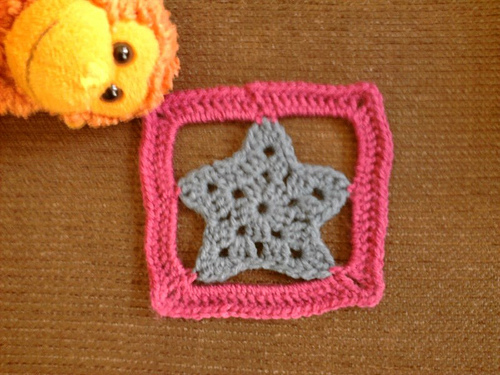 I got a request through Ravelry this morning from someone wanting to turn the granny star into a blanket square. I hadn’t really thought about it before but, as it was a lazy Sunday morning, I was happy to give it a go. It does work but I think the squares may have to be interspersed with more solid squares before you could make a blanket using them. 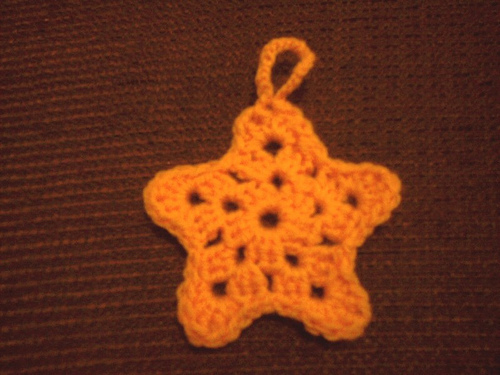 One benefit of this is that I realised there was a typo in the final round of the original granny star pattern. I have amended this but I feel bad about anyone who came a cropper on it in the past. Sorry! 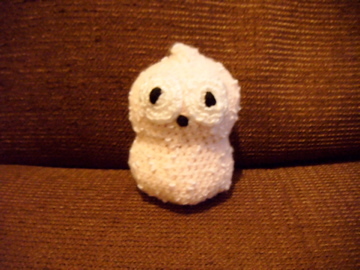 To make amends I thought I would post this here and on Ravelry for anyone who fancies it. Round 1: Chain 6, slip stitch into first chain to create a loop. Round 2: Chain 3 (counts as treble throught out), 2 trebles into the ring, chain 3. *3 trebles into the ring, chain 3**. Repeat *-** 4 times. (5 groups of 3 trebles made.) Join with a slip stitich in first 3 chain of the round. Round 4: Slip stitch into first 3 chain space from the previous round. Chain 1, (1 double crochet, 1 half-treble, 1 treble, 1 double treble, 1 treble, 1 half-treble, 1 double crochet) in same chain space, chain 1, *slip stich in next 1 chain space, chain 1, (1 double crochet, 1 half-treble, 1 treble, 1 double treble, 1 treble, 1 half-treble, 1 double crochet) in next chain space from previous round, chain 1. ** Repeat from *-** 4 times. Slip stitch into final 1 chain space, chain 1, slip stitch into first dc to join. Fasten off. Round 5: Attach yarn to any double treble crochet from the previous round, chain 1 and dc into same stitch, 19 chain, 1 dc into next double treble crochet, chain 9, 1 dc into next double treble crochet, chain 18, 1 dc into next double treble crochet, chain 9, 1 dc into next double treble crochet, chain 19. Slip stitch into first dc. Round 6: Chain 2, treble crochet in same stitch, 10 treble into the chain, chain 3, 9 treble into chain, 1 treble into dc from previous round, 9 treble into chain, 1 treble into dc from previous round, chain 3, 19 treble into chain, 1 treble into chain from previous round, chain 3, 9 treble into chain, 1 treble into dc from previous round, 10 treble into chain, chain 3, 10 treble into chain, slip stitch into first treble. Round 7: Chain 1 and dc in same stitch. Dc round into each treble and 3 dcs in each 3 chain corner space. Fasten off. 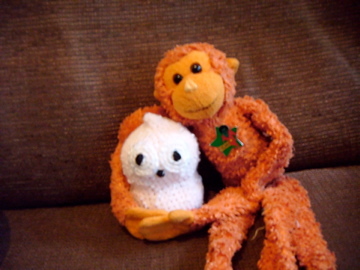 Monkey has been photobombing again. We had the charity sale yesterday for which I had been producing Christmas decorations. Rather stupidly I forgot to take a photo of the pile before sending them off to their fate. 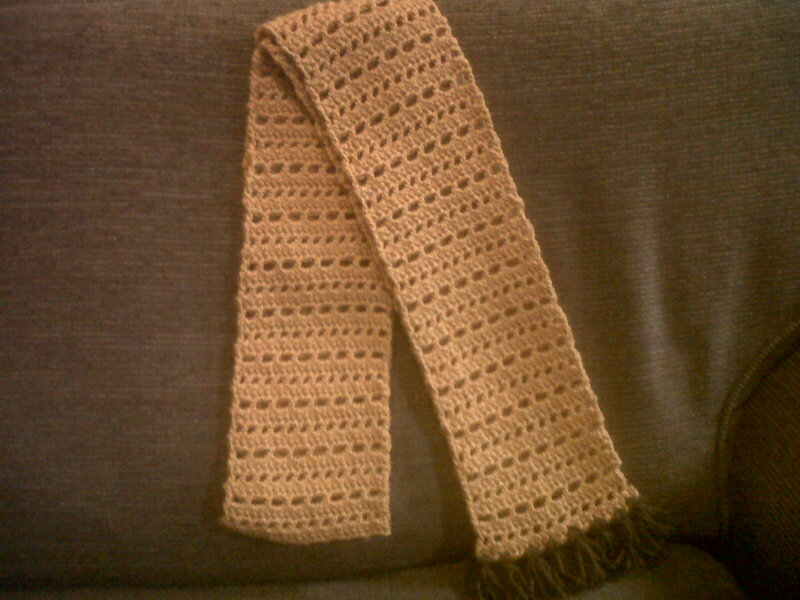 There were about 30 when I finished and I am pleased to say that everything apart from the Granny Stars sold out. I am guessing that the problem with the stars lay in the fact that yellow just isn’t a Christmassy colour. 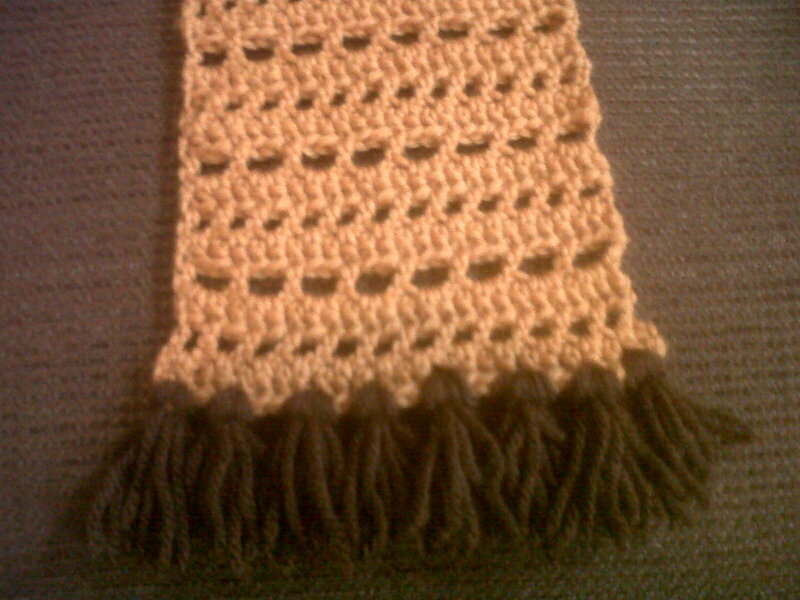 I might have done better using gold or silver yarn rather than bright yellow. The most popular item took me totally by suprise. 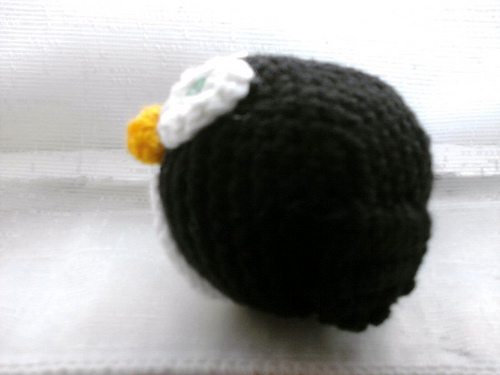 I had a stab at making a penguin but when I finished I wasn’t sure it was a total success. 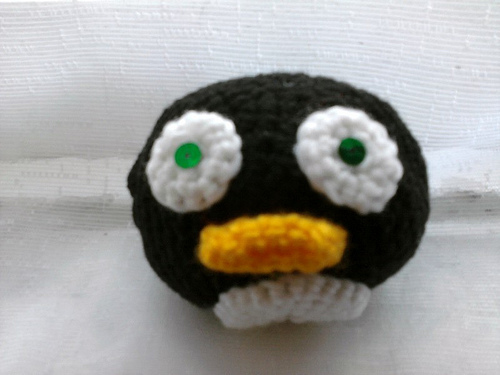 I asked Mr Crochethook for his opinion and he pointed out that, although it looked liked a penguin, there was something about it that reminded him of Mr Flibble. He had a point. The people at the sale, however, seemed to be attracted to pissed off looking penguins. I could have sold half a dozen of them – instead I took orders. They've been very bad, Mr Flibble. What are we going to do with them? 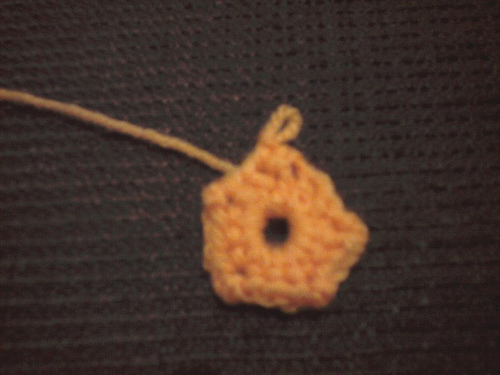 Row 1: With yellow yarn chain 6. 1 dc into each chain across. 2 stitches into the end of the chain. 1 dc back across the bottom of the chain. 2 dc into end of the chain. Row 2: 1 dc into each stitch around. Fasten off. Round 1 : With white yarn chain 2. 6 dc into second chain from the hook, join with a slip stitch in first dc. Round 2: 2 dc into each stitch round, join with a slip stitich in first dc. Fasten off. Round 2: 2 dc into each stitch round, join with a slip stitich in first dc. Round 3: 1 dc in first dc, 2 dc in next dc. Repeat to the end of the round. Slip stitch into first dc. Round 4: 1 dc in first 2 dc, 2 dc in next dc. Repeat to the end of the round. Slip stitch into first dc. Fasten off. Row 1: With black yarn chain 8. Dc into second chain from the hook, 1 dc in each stitch across. Chain 1 and turn. Row 2-4: 1 dc into each stitch across. chain 1 and turn. Row 5: 2 dc tog, 1 dc into next 3 stitched, 2 dc tog. Chain 1 and turn. Row 6: 2 dc tog, 1 dc in centre stitch, 2 dc tog. Chain 1 and turn. Row 7: 1 dc in each stitch across. Fasten off. Round 1: Make magic loop. 6 dc into the loop. Round 2: 2 dc into each stitch round. Round 3: 1 dc into first dc, 2 dc into next dc. Repeat to the end of the round. Round 4: 1 dc into first two dc, 2 dc into next dc. Repeat to the end of the round. Round 5: 1 dc into first three dc, 2 dc into next dc. Repeat to the end of the round. Round 6: 1 dc into first four dc, 2 dc into next dc. Repeat to the end of the round. Round 7-16: 1 dc into each stitch round. * At the end of round 16 sew on beak and wings. Round 17: 1 dc into first four dc, 2 dc tog over the next two stitches. Repeat to the end of the round. Round 18: 1 dc into first three stitches, 2 dc tog over the next 2 stitches. Repeat to the end of the round. Round 19: 1 dc into the first two stitches, 2 dc tog over the next 2 stitches. Repeat to the end of the round. *Stuff at the end of round 19. Round 20: 1 dc into the first two stitches, 2 dc tog over the next 2 stitches. Repeat to the end of the round. Round 21: 2 dc tog over the first two stitches. Repeat to the end of the round and fasten off. Glue eyes and feathers into place. Add two sequins to the centre of the eyes for pupils. If you really want to recreate Mr Flibble and his hex vision, you could use red instead of green. Add a hanging loop if required. Side view. Sorry, the wings don't show up too well. 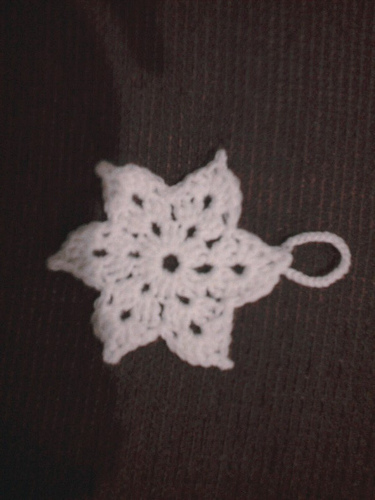 This tree decoration grew out of the snowflake decoration I blogged the other day. 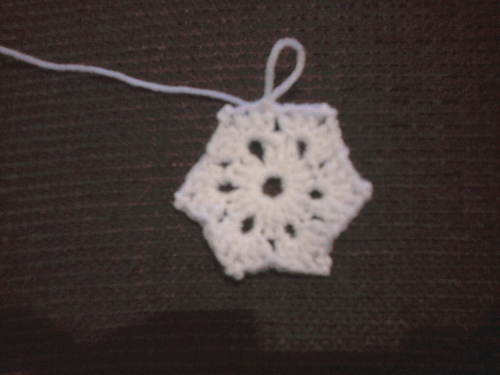 Again it is a modified granny square. This time it uses a granny pentagon as a base with a modified final round. I have included photos of each round as a visual guide. This too take minutes to complete. Round 4: Slip stitch into first 3 chain space from the previous round. Chain 1, (1 double crochet, 1 half-treble, 1 treble, 1 double treble, 1 treble, 1 half-treble, 1 double crochet) in same chain space, chain 1, *slip stich in next 1 chain space, chain 1, (1 double crochet, 1 half-treble, 1 treble, 1 double treble, 1 treble, 1 half-treble, 1 double crochet) in next chain space from previous round, chain 1. ** Repeat from *-** 4 times. Slip stitch into final 1 chain space, chain 1, slip stitch into first dc to join. Finishing: If you want to add a hanging loop, slip stitch into first double treble of round 4, chain 25, slip stitch into same double treble and fasten off. Another quick Christmas Decoration Pattern I wanted to blog. 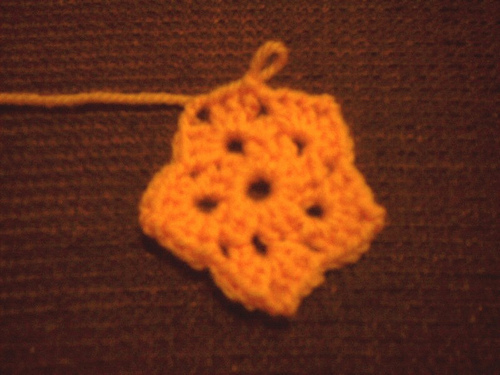 If you can make a basic granny square, you can make this in minutes. I have included photos of the rounds as a guide (with my shadow making a guest appearance) but it is basically a granny hexagon with a modification in the final round. Round 4: Slip stitch into first 3 chain space of the previous round, chain 3, 3 trebles into the same chain space from previous round, chain 3 and join into 3rd chain from the hook to create picot, 3 trebles into same chain space from previous round, chain 1. Slip stitch in next 1 chain space from previous round. Chain 1. *4 trebles into next 3 chain space, chain 3 and join with a slip stitich into 3rd chain from the hook to create picot, 3 trebles into same chain space from previous round, chain 1. Slip stitch in next 1 chain space from previous round. Chain 1. ** Repeat from *-** 5 times, . Join with slip stitch into top of 3 chain which began the round. Finishing: If you would like to create a hanging loop for your snowflake, slip sitich into 3rd treble of the first point from round 4, chain 25 and join with slip sitich into 5th treble from round 4. Fasten off. Pull picots to create sharp edges to the snowflake points. I have spent this week knocking out Christmas decorations to be sold at a charity event in December. I have been raiding books, magazines and websites for inspiration but there were quite a large number of patterns that I just wasn’t happy with. One of the items that gave me the most problems was a Gingerbread Man. None of the patterns I found came out right when I tried them so, in desperation, I made up my own. 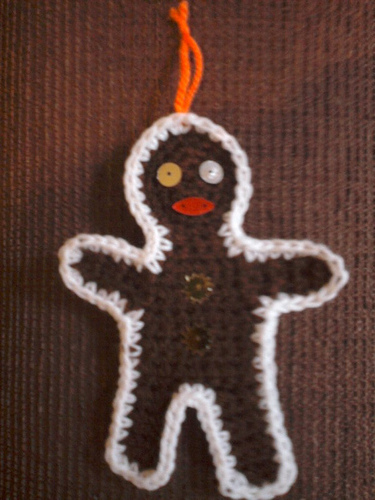 I hope to get the chance to blog some of the other patterns I have written before Christmas but I thought I would start with my Gingerbread Man as I am really rather pleased with him. 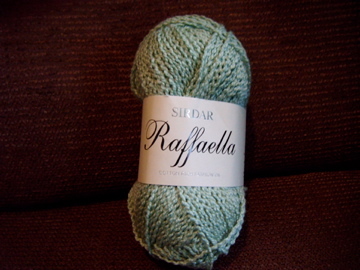 I used DK weight wool and 3.5mm hook but I think it would work as well with adjustments for the yarn you have on hand. Round 2: Chain 1, 2 dc in crochet in each stitch round. Row 4-11: 1 dc in every stitch and turn. Do not fasten off. Row 12: 1 dc in first 3 stitiches. Turn. Row 19: 1 dc in each stitch and fasten off. Attach yarn at other side of the body and repeat rows 12-19 to create the second leg. Row 20: Attach yarn at Row 2 of the main body. 1 dc in next 3 stitches/rows and turn. Row 26: 1 dc3tog and fasten off. Repeat rows 20-26 for other arm. 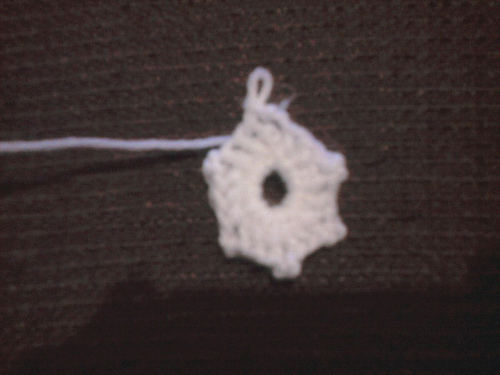 Attach white yarn and work one dc around the outline of the piece. Attach beads or sequins for facial features and buttons or embroider details. Attach a small piece of yarn or ribbon at the top for hanging. You may wish to starch the piece to give it some rigidity.